This article was written by Anjali Garg and Ryan Flynn, International Budget Partnership. Myanmar is a country in the midst of enormous change. In 2011 the country embarked on a series of reforms that have helped pull it out of decades of isolation. The transition from military rule toward more open governance has included establishing a parliament, implementing a more market-based economic system, relaxing media censorship, and negotiating ceasefire agreements aimed at ending some of Asia’s longest-running conflicts. The government has also signaled a willingness to improve transparency and accountability, including signing on to the Extractive Industries Transparency Initiative (EITI) and the Open Government Partnership (OGP). And a new law loosening the government’s grip on civil society was enacted in July 2014. Progress toward more open budgets remains nascent. IBP’s Open Budget Survey Tracker – an online tool that monitors the availability of budget information – shows most documents still remain under wraps. Despite producing a wealth of budget information, the government is currently publishing only the final Enacted Budget. This means that crucial documents produced by the government, such as the Draft Budget and the Audit Report, remain off limits to the public. IBP recently sent a team to Myanmar to explore opportunities to expand budget transparency, participation, and accountability. We found that current efforts to strengthen Myanmar’s budget system are focused primarily on building government’s capacity. A similar commitment should be made to strengthening local civil society and opening up space for public participation. Recognizing the links between better budgets and improved service delivery, donors have made strengthening the government’s ability to manage public finances a priority. The World Bank, the United Kingdom, and Australia have committed a collective $55 million over the next five years (through 2019) to providing Myanmar with technical and financial assistance for public finance management reforms. Few would question the need for government to have the skills and capacity to manage public money, and donors are doing an impressive job of matching these needs with resources. But an effective budget is more than the product of strong government systems: the ability of those outside government to understand and participate in budget decisions, and to hold government to account for how money is raised and spent, is crucial. Many of the donors we met with acknowledged the importance of reforming budgets to be more inclusive. But so far the process has been to inform rather than consult those outside government about reforms. Little has been done to facilitate a much-needed dialogue between local civil society and the finance ministry. As a result, many are left disconnected. This is a missed opportunity to ensure that issues that are often championed by civil society, such as transparency and participation, are high on the PFM reform agenda. Importantly, donors are currently investing too little in building the capacity of local civil society to directly engage in budget issues and undertake budget analysis. Holding government to account for how it is raising and spending public money depends on the ability of civil society to analyze and use budget information. We know from experience that, much like building the capacity of government, equipping civil society organizations with the necessary knowledge and skills takes time. If civil society appears to be largely disconnected from the reform process, the general public appears to be struggling to make sense of the enormous changes underway. 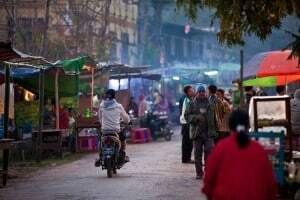 A groundbreaking report by the Asia Foundation found that the public, while generally upbeat about the country’s future, has “very limited knowledge about the current structure and functions of various levels of government.” At the same time, those surveyed placed remarkable importance in citizen participation in governance: 94 percent believe it to be very or somewhat important; virtually no one believes it is unimportant (see chart below). A lack of understanding on the particulars of government should not be an excuse for excluding the public from the process of reform and government decision making more broadly. 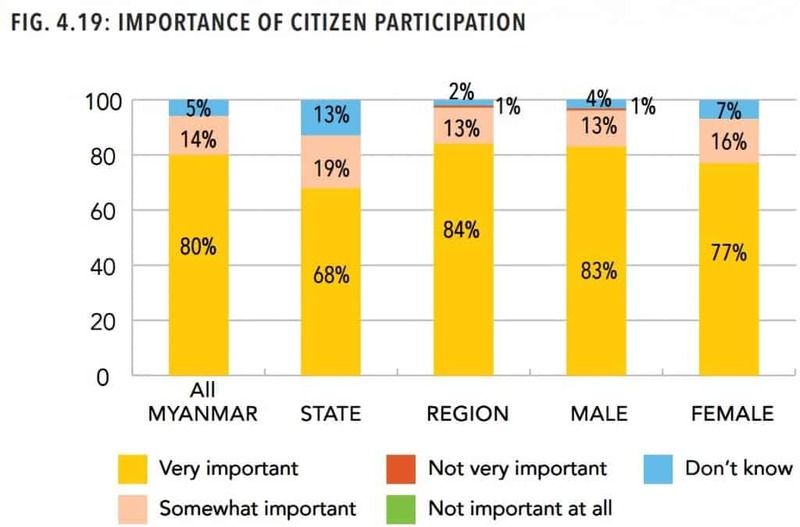 Rather, the Myanmar government and donors should seize on this widespread optimism and appetite for public participation to inform and involve the people in governance decisions. In the context of government budgets, this means laying the foundation for an informed and engaged civil society that can shape budget priorities, draw the public’s attention to budget issues, and hold the government to account on its management of public resources. To its credit, the UK’s Department for International Development (DfID) has earmarked US$6.8 million from its PFM program to support civil society. While this is a good sign, so far none of the funds have actually been disbursed according to DfID’s Development Tracker. Delaying this effort has the effect of sequencing civil society budget work until after other reforms have taken root and, in doing so, threatens to undermine some of the fundamental objectives of donor support. Building more accountable, inclusive budgets, in which the public plays a greater role, is not a narrow technocratic exercise. International experts can help to deliver better budget systems, but building the capacity of local civil society to monitor and influence public spending is essential to better outcomes. Investing in civil society is also likely to stoke demand for greater budget transparency and space for participation. Donors can add momentum by encouraging the government to make more budget information publicly available. If the government is serious about instituting a more open and participatory governance system, a significant step toward this can be achieved at little or no cost by simply publishing the budget documents that are already produced. Increasing opportunities for the public to participate in budget decisions is no less important. The finance ministry should organize meetings around Myanmar to collect citizens’ views on budget priorities, and the national parliament should open their hearings on budget oversight decisions to the public. The Asia Foundation’s findings suggest that there is an optimistic populace eager to engage, but it lacks a solid understanding of how the government works. Greater participation from the public will not only help the government better understand people’s priorities and needs, but also allow the public to “learn by doing” as they engage in budget and service delivery decisions that have a direct bearing on their lives. These three elements – supporting local civil society, increasing budget transparency, and encouraging public participation – should happen at the same time as investments in better budgetary systems and improvements in government capacity. Without each of these, donors run the risk of merely strengthening Myanmar’s government, not strengthening Myanmar’s governance.